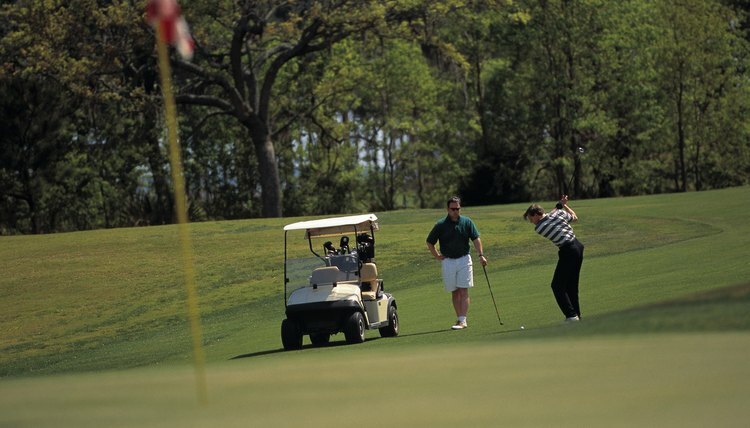 A two-person scramble event sometimes uses handicaps. Two-person or four-person team scrambles allow each player on a team to contribute good shots and putts while minimizing the individual's poor shots. As a result, lesser-skilled golfers usually are more comfortable playing a scramble format, since they can lean on their teammates for support. A two-person scramble, though, puts more pressure on each player, since there is only one teammate to lean on instead of three. Hit your drive. In a two-person scramble, each person hits from the tee. The team then chooses the best of the two drives, and then picks up the other ball and takes it out of play. The players move to the position of the better drive for the team's next shot. Continue using the same format for each shot. Both players hit their second shots from the spot of the selected drive. The team chooses the best second shot, and then both players hit their third strokes from the position of the preferred second shot. Putt using the same team format. When your ball and/or your teammate's ball is on the green, pick the ball closest to the pin -- or the ball in the easiest putting position. Both players will putt from that position. Continue until one team member sinks the putt. The hole is over after one of the balls is in the hole, so you must mark your ball and allow your partner to putt.